has propelled Robert J. Sawyer into the limelight as one of science fiction's hot new writers, earning him the prestigious Nebula Award in the process. 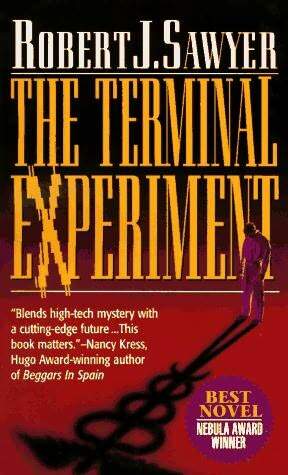 In this fast-paced thriller, Dr. Peter Hobson’s investigations into death and afterlife lead him to create three separate electronic versions of himself: one has no memory of physical existence and represents life after death; one has no knowledge of death or aging and represents immortality; and the third is left unaltered as a control. But all three have escaped into the worldwide matrix... and one of them is a killer. , before its first novel publication in May, 1995. Won Nebula Award for Best Novel in 1995. Nominated for Hugo Award for Best Novel in 1996. In the last analysis, it is our conception of death which decides our answers to all the questions life puts to us. “What room is Detective Philo in?” asked Peter Hobson, a tall, thin man of forty-two, with hair an equal mixture of black and gray. Peter began down the corridor. The nurse came around from behind the desk and gave chase. “You can’t go in there,” she said firmly. “I’ll call security,” said the nurse, trying to keep her voice low so as not to alarm the patients. Peter didn’t look back. “Fine,” he snapped, his long legs carrying him quickly down the corridor. The nurse waddled toward her desk and picked up the phone. Peter found 412 and entered without knocking. Sandra was hooked up to an EKG; it wasn’t a Hobson unit, but Peter had no trouble reading its display. A drip bag of saline was on a pole beside her bed. Sandra opened her eyes. It seemed to take a moment for them to focus. “You!” she exclaimed at last, her voice raw and thin — the effects of the beamer. Every word was a struggle for Sandra. “You tried … to have me … killed,” she said. “Remove him,” said the nurse. “Let’s go,” said the guard. “Come along now, buddy,” said the other guard gruffly. “We can’t do that, ma’am,” said one of the guards. Sandra managed to roll her head slightly in the nurse’s direction. “It’s … okay,” she said, faintly. The nurse was seething. The tableau held for several seconds, then the woman nodded. “All right,” she said, perhaps the talk of police business and unsolved crimes convincing her she was out of her depth. “With my ex now,” she said. “I want you to know, I’m going to take care of her financially. Everything she needs — clothes, cars, university, vacations in Europe, whatever. I will pay for it all. I’ll set up a trust fund.” Sandra’s eyes were wide. Kid, he’d said. Some kid’s life cut short. A teenaged boy. Peter shook his head. “I’m in,” he said. “OR 3,” said Kofax. “Start prep in an hour.” He hung up. Peter hurried to get dressed. Motorcycle accident, just as Kofax had said. Enzo Bandello, he thought. Seventeen. In trying to save the boy, the trauma team had given him dopamine and had deliberately dehydrated him, in hopes of reducing the brain swelling normally associated with a severe head wound. Too much dopamine, though, would damage the heart muscle. According to the chart, at 2:14 A.M., they’d begun flushing it from his body and fluids were being pumped in. Latest reading showed his blood pressure was still too high — an effect of the dopamine — but it should come down soon. Peter flipped pages. A serology report: Enzo was free of hepatitis and AIDS. Blood count and bleeding studies looked good, too. A perfect donor, thought Peter. Tragedy or miracle? His parts would save the lives of a half dozen people. Mamikonian would take the heart out first, a thirty-minute operation. Then the liver — two hours’ work. Next, the renal team would remove the kidneys, another hour’s cutting. After that, the corneas. Then the bones and other tissues. There wouldn’t be much left to bury. Peter put the clipboard back into the carousel and walked through the double doors that led to the rest of the hospital. There were two equally good routes to OR 3. He chose the one that went by the chapel. He was not a religious person. His family, back in Saskatchewan, was white-bread Canadian Protestant. Last time Peter had been in church was for a wedding. Time before that, a funeral. He could see the Bandellos from the hallway, seated in a middle pew. The mother was crying softly. The father had an arm around her shoulders. He was a deeply tanned man wearing a plaid work shirt with cement stains on it. A bricklayer, perhaps. A lot of Toronto’s Italians of his generation worked in construction. They’d come over after World War II, unable to speak English, and had taken hard-labor jobs to make a belter life for their kids. And now this man’s kid was dead. The chapel was denominationally neutral, but the father was looking up, as if he could see a crucifix on the wall, see his Jesus hanging there. He crossed himself. Somewhere in Sudbury, Peter knew, there was a celebration going on. A heart was coming; a life would be saved. Somewhere there was joy. He continued on down the corridor. Peter arrived at the scrub room. Through a large window, he could see into the operating theater. Most of the surgical team was already in place. Enzo’s body had been prepped: his torso shaved, two layers of rust-colored iodine painted on, clear plastic stretched over the surgical field. Peter tried to get a look at that which the others had been trained to ignore: the face of the donor. Not much of it was visible; most of Enzo’s head was covered by a thin sheet, exposing only the ventilator tube. The transplant team was deliberately kept ignorant of the donor’s identity — made it easier, they said. Peter was probably the only one who knew the boy’s name. There were two scrub sinks outside the OR. Peter began the regulation eight minutes of washing, a digital timer above the sink counting down the time. After five minutes, Dr. Mamikonian himself arrived and began scrubbing at the second sink. He had steel-gray hair and a lantern jaw — more like an aging superhero than a surgeon. “You are?” asked Mamikonian as he scrubbed. The counter above Peter’s sink bleeped. He wasn’t used to this; his hands felt raw. He held his dripping arms out at chest height. A scrub nurse appeared with a towel. Peter took it, dried his hands, then stepped into the sterile green gown she was holding for him. She tore open a package, removed the latex gloves, and snapped them onto his hands. Peter entered the OR. Overhead, a dozen people were watching through the glass ceiling from the observation gallery. In the center of the room was a table holding up Enzo’s body. There were several tubes going into it: three volume lines, an arterial line to monitor blood pressure, a central venous line threaded into the heart to monitor hydration level. A young Asian woman sat on a stool, her eyes scanning the volume monitor, the CO2 monitor, and the volumetric infusion pump. Until his arrival, the woman had also been watching the EKG oscilloscope mounted above Enzo’s head. Peter moved into position next to it and adjusted the contrast on the display. The pulse rate was normal, and there was no sign of damage to the heart muscle. It chilled him. The guy was legally dead, and still he had a pulse. Hwa’s mouth was covered by a face mask, but Peter could see her eyes crinkle in a smile. “You get used to it,” she said. Across the room, an illuminated panel had Enzo’s chest X-ray clipped to it. The lungs hadn’t collapsed and the chest was clear. The heart, a silhouette in the center of the image, looked fine. Mamikonian entered. All eyes turned to face him — the conductor for their orchestra. “Good morning, everyone,” he said. “Let’s go to work, shall we?” He moved in to stand over Enzo’s body. “Blood pressure’s falling a bit,” said Hwa. Mamikonian stood on Enzo’s right, next to his chest. Across from him was the scrub nurse. A surgical assistant stood next to her, holding the abdominal-wall retractor. Five one-liter containers of ice-cold Ringer’s lactate were lined up in a neat row on a table so they could be emptied quickly into the chest cavity. A nurse also had six units of packed red blood cells ready to go. Peter tried to stay out of the way near the head of the bed.
. Nearby, another technician carefully watched the rising and falling of the ventilator’s black bellows to make sure Enzo was still breathing properly. Dr. Mamikonian requested a scalpel and made an incision starting just below the Adam’s apple and continuing down the center of the chest. The scalpel split the skin easily, sliding through the muscle and fat until it banged against the breastbone. The EKG shuddered slightly. Peter glanced at one of Hwa’s monitors: blood pressure was rising, too. Mamikonian squinted at Peter’s oscilloscope. “That’s normal,” he said, sounding irritated at being interrupted. Mamikonian handed the scalpel, now slick and crimson, back to the nurse. She passed him the sternal saw, and he turned it on. Its buzzing drowned out the blipping from Peter’s EKG. The saw’s rotating blade sliced through the sternum. An acrid smell rose from the body cavity: powdered bone. Once the sternum was cut apart, two technicians moved in with the chest spreader. They cranked it around until the heart, beating once per second, was visible. Mamikonian looked up. On the wall was the digital ischemic counter; it would be started the moment he excised the organ, measuring the time during which there would be no blood flowing to the heart. Next to Mamikonian was a plastic bowl filled with saline. The heart would be rinsed in there to get old blood off it. It would then be transferred into an Igloo container filled with ice for the flight to Sudbury. The chest of Enzo Bandello, legally dead organ donor, heaved massively. A gasp escaped from around his ventilator breathing tube. A moment later, a second gasp was heard. “Christ — ” said Peter, softly. She moved in and administered a second shot. Peter was dazed. Mamikonian departed with the excised heart. Since that meant there was no more need for an EKG operator, Peter went up to the observation level and watched the rest of the harvesting from there. When it was done — when Enzo Bandello’s hollow corpse was sewn shut and rolled off to the morgue — Peter staggered down to the scrub room. He found Hwa, who was pulling off her gloves. “What happened in there?” Peter asked. “Anesthetize the corpse…?” said Peter slowly. Peter kept a little copy of the timetable for his girlfriend, Cathy Churchill, in his wallet. He was in the first year of his master’s; she was in her last year of her bachelor’s in chemistry. She would be finishing her final class of the day — polymers — in about twenty minutes. He hurried back to the campus and waited in the hall outside the classroom for her. Peter smiled at Jasmine briefly, but really only had eyes for Cathy. Cathy had a heart-shaped face, long black hair, and enormous blue eyes. As always, she smiled radiantly when she saw Peter. Despite what he’d seen earlier in the day, Peter felt himself grinning, too. It happened every time. There was an electricity between them — Jasmine and their other friends often commented on it. “I’ll leave you two lovebirds alone,” said Jasmine, still grinning. Peter and Cathy said good-bye to her, and the two of them came together in a kiss. In that brief moment of contact, Peter felt himself revitalized. They’d been dating for three years now, and still there was wonder in each embrace.